After shelter water is the most important thing to acquire when surviving in the wilderness. It used to be that there was plenty of fresh water safe to drink, but due to pollution and other man-made trouble very little water out there is safe to drink straight from the stream without being purified or filtered. If you’re just hanging around in the woods two liters a day would be sufficient to keep you hydrated, but if you’re hiking ten miles a day or working hard you’ll need to drink more. One piece of advice here: if you have a chance to fill your canteens do it. I was hiking in the mountains once and thought I’d save a little weight if I only filled one of my canteens. Rookie mistake. I’d looked at the maps and saw that we’d be passing some streams; however, I didn’t take into account that it was August. The two streams we passed were completely dried up and we drank our one canteen of water long before we found water and were dangerously dehydrated. To reiterate – if you have a chance to fill up your canteens do so! Giardia lives in the intestines of infected humans or other animals, individuals of which become infected by ingesting or coming into contact with contaminated foods, soil, or water tainted by the feces of an infected carrier. The symptoms of Giardia, which may begin to appear 2 days after infection, include violent diarrhoea, excess gas, stomach or abdominal cramps, upset stomach, and nausea. Resulting dehydration and nutritional loss may need immediate treatment. A typical infection can be slight, resolve without treatment, and last between 2–6 weeks, although it can sometimes last longer and/or be more severe. Coexistence with the parasite is possible (symptoms fade), but an infected individual can remain a carrier and transmit it to others. Medication containing tinidazole or metronidazoledecreases symptoms and time to resolution. Albendazole is also used, and has an anti-helmintic (anti-worm) property as well, ideal for certain compounded issues when a general vermicidal agent is preferred. Giardia causes a disease called Giardiasis, which causes the villi of the small intestine to atrophy and flatten, resulting in malabsorption in the intestine. Lactose intolerance can persist after the eradication of Giardia from the digestive tract. From what he told me about the symptoms you can believe me when I say that you really don’t want any part of this. He was sitting on the toilet and throwing up into a trashcan at the same time for hours before he started feeling even a little bit better. There are literally dozens of bacterial and protozoan infections you can get through water and a little prevention goes a long way. Your best bet in the wilderness is to purify your water through boiling, filtering, or by use of chemicals. Boiling is probably the surest way to make sure all the little bugs that will make you sick are good and dead. Some people say to boil ten minutes, others say five, and yet other folks say one minute is enough. In the past I’ve typically boiled water for a minute and had good luck, but if you’re in a really rancid patch of water you might want to boil it longer. Jarhead Standing Next to a Waterfall on the AT. I’ve also used various types of filters. 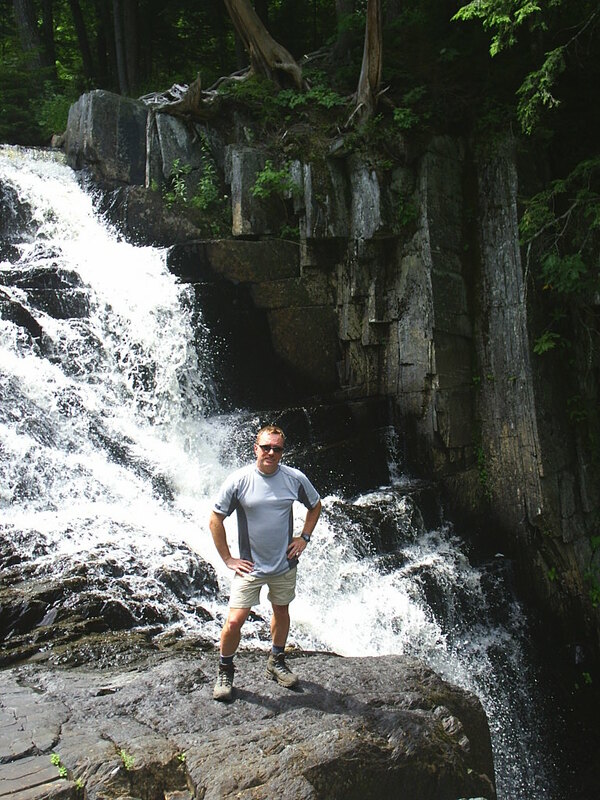 When I was hiking the 100 Mile Wilderness in Maine I used a Katadyn filter and it worked fine. I’ve also used Lifestraws with good luck. As a matter of fact I drank swamp water with a Lifestraw and didn’t get sick, but the smell of the water as I drank it was enough to make my eyes water! Here’s my recommendation on how to purify water. First, get the water from your water source. If it’s got particulates floating around strain it through your bandanna to remove the bigger ones. Strain it twice or three times if you need to. Boil it. Boiling is your best best bet for killing off the nasty bugs. The water might taste flat after you boil it, but you can aerate it by pouring it back and forth between another clean container. I’ve probably filtered more water to drink than boiling to be honest. I like to find a place where the water is running if possible and put the end of the filter in there. This doesn’t mean it will be germ free, but it might help with the particulates. Filtering is pretty easy to do. I like to wait until I find a small stream of running water then take my filter and water bottles down to the edge. Once there I throw the intake hose into the water and put the output hose on top of my water bottle and start pumping. For one person you can probably fill up a water bottle in just a minute or two, but if you have a lot of people this process can take awhile. Another way to purify water is through chemicals. There are different types of chemicals you can use including: chlorine, iodine, and oxidizers. Use three to six drops of chlorine per quart of water. If you have a good old fashioned military canteen fill it up from your water source, add three to six drops of unscented and color free chlorine and that should take care of you. Iodine comes in tablet form, which is probably the easiest way to do it. This leaves a rather nasty taste in the water (which can be reduced by using vitamin C). Let it stand for twenty to thirty minutes before adding the vitamin C or drinking. The chemical needs time to do its job. There’s a kit out there that lets you add the iodine and then after its been purified you add another chemical and that takes the iodine taste out. I’ve never used it before, but I’ve seen it used on the Appalachian Trail. When it’s time to set up a camp try to do so reasonably close to a fresh water supply. This way you don’t have to spend a lot of time hiking back and forth to the watering hole. In the past I’ve set up camp a good distance away from a water source and it’s pretty annoying hiking a long distance to fill up a couple of canteens of water. Sometimes you might not have a choice, but if you scout around a little bit you should find a good spot within a stones throw from the water. Don’t forget that other critters out there need to drink too and you might run into them while you’re down there filling up your water bottle. If you’re going to use the water for cooking go ahead and boil it and by the time you add it to your freeze dried food or whatever it will be okay to ingest. Make sure it reaches a roiling boil first! Bear in mind that none of these will remove pollutants like mercury and other heavy elements. To summarize when you’re out there hiking and camping in the wilderness make sure you purify your water before drinking. There are several different methods to purify water and you’ll need to find the one that works best for you. How do you purify your water when you’re in the wilderness?